The Tourism Authority of Thailand (TAT) continues to follow the royal wisdom of the late King Bhumibol and bring His Majesty King Vajiralongkorn’s idea to disseminate and further implement royal projects with the development of major tourism routes in five regions. Following the royal wisdom on sustainable development will encourage local people to use local experience to generate more income an develop their communities, thus this will build tourism sustainability in long term. TAT also invites Thai people to join its online activity to vote for favourable tourism routes. Winners will receive the prize to join tourism routes, which follow the royal wisdom. Mr. Yuthasak Supasorn, TAT Governor, said the project on tourism route development to follow the royal wisdom is being organised in remembrance of His Majesty the Late King Bhumibol and to continue his wisdom through community tourism development under the “Local Experience” concept. Travel with learning is impressive and supports income distribution to local communities, which will then sustainably develop the Thai tourism industry. The “tourism route development to follow the royal wisdom” project will present attractive tourism routes, which are linked with royal projects initiated by the late King Bhumibol to solve environmental problems from water resources, soil, to forest. This tourism project will also disseminate and follow his royal wisdom on Sufficiency Economy. Currently, there are more than 4,700 royal projects nationwide, where Thai people can learn from the late King Bhumibol’s life works and apply with their daily lives and create new careers for community people. Several tourism destinations are very beautiful and attractive, showing the charming Thai culture and the opportunity of Thai tourism to welcome tourists from around the world. Under this tourism project, five pilot tourism routes in five regions are designed to follow the royal wisdom and link with royal projects in each province. Backed by the story related to the royal projects, the five tourism destinations and tourism routes will be more interesting and there are many types of tourism destinations from OTOP villages, arts and craft centres, to trade centres. The “follow the royal wisdom in Chiang Mai” route comprises the Vichaya farm and Ban Rai Gong Khing Community in Chiang Mai. The “follow the royal wisdom in Buri Ram” route comprises the improvement of Ton Lam Pa Tia Reservoir and Ban Khok Muang Community in Buri Ram. 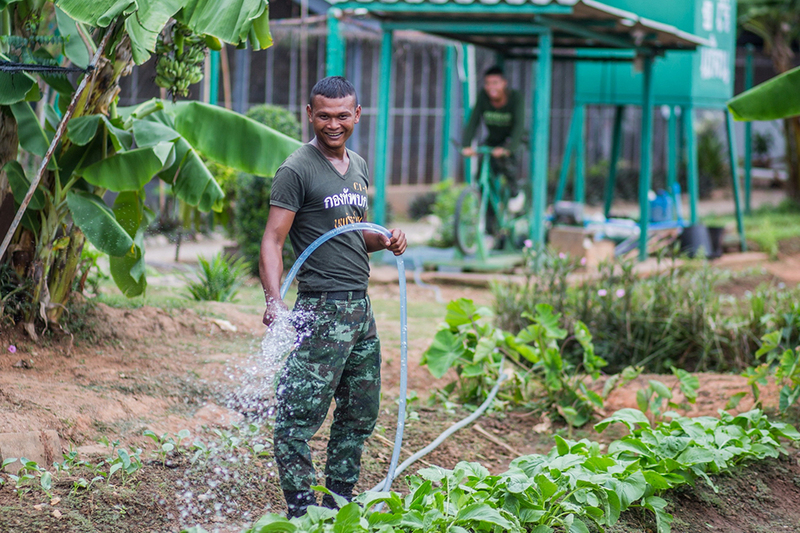 The “follow the royal wisdom in Ratchaburi-Nakhon Pathom” route includes the 1-rai project to solve poverty under the Sufficiency Economy concept in the military learning center in Ratchburi and Ban Sala Din Community in Nakhon Pathom. The “follow the royal wisdom in Rayong” route comprises the Pluak Daeng Development and Service Center under the royal initiative and Pak Nam Pra Sae Community in Rayong. The “follow the royal wisdom in Nakhon Si Thammarat” route includes the Pak Panang River Basin Development project and Ban Laem Home Stay Community in Nakhon Si Thammarat. TAT is confident that the “tourism route development to follow the royal wisdom” project will attract more tourists to visit local communities, promote new tourism routes and promote income distribution to communities. It expects tourism incomes in these new tourism routes will grow at least 20%.